The Pengra Covered Bridge was constructed with two of the longest timbers ever used in building one of Oregon&apos;s covered bridges. Drive through this bridge as part of a scenic exploration of the Jasper Lowell Road area that includes Unity Covered Bridge. B.J. Pengra was a pioneer who surveyed Oregon in 1862. A railroad station on the Cascade Line of the Southern Pacific Railroad was named after him. In 1904 the Pengra Unity Road replaced the old railroad grade and a 192-foot span was built. 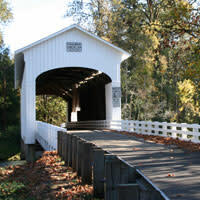 Weather and age contributed to its closure in 1979 until the county received a grant from the Oregon Covered Bridge Program. The bridge was overhauled a few feet downstream. Too large for Springfield&apos;s Booth-Kelly Lumber Company mill in Springfield, the wood was rough-hewn in the forest, hauled to location and finished on-site. The two planks are 16 inches by 18 inches by 125 feet each. Using one-piece chords resulted in an extra strong truss. Another distinctive feature is a small roofed window on the southwest-facing side that allows drivers to see oncoming traffic as it approaches the bridge. In 1995 it was repaired and re-opened to traffic after a fifteen year closure. In 2015, the roof was replaced. The Pengra Unity Road has been renamed Place Road, however the bridge retains the former Pengra name. Drive through this classically beautiful covered bridge, sometimes called "Fall Creek Bridge." 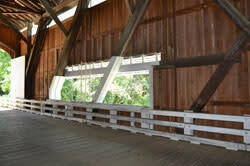 Built in 1938, the Pengra Covered Bridge contains the two longest planks ever used in Oregon covered bridge construction. The bridge itself is not long, just 120 feet (37 m). 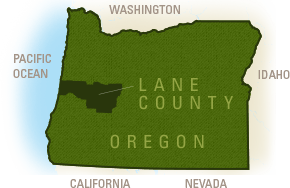 Incorporate the nearby Unity Covered Bridge for a picturesque road trip through Oregon's back country. DIRECTIONS: Located on Place Rd just off Jasper-Lowell Rd, north of the Fall Creek community.